Since the release of this futuristic thriller in 1982, "Blade Runner" has remained one of the few science-fiction movies to retain its originality and freshness. With his 'Director's Cut' , Ridley Scott has introduced a further perspective to this visually overwhelming movie. For its initial release a voiceover was added which has now been removed and, with a substantially changed ending, this re-edited version is presented in its intended widescreen format. Retired Super-cop 'blade runner', Harrison Ford is specialised in identifying and destroying androids. He is pressed back into service when a group of 'replicants' illegally return to Earth, but he soon finds himself as a desperate, vulnerable and uncertain as the androids themselves. Official Run Time: 112 mins. 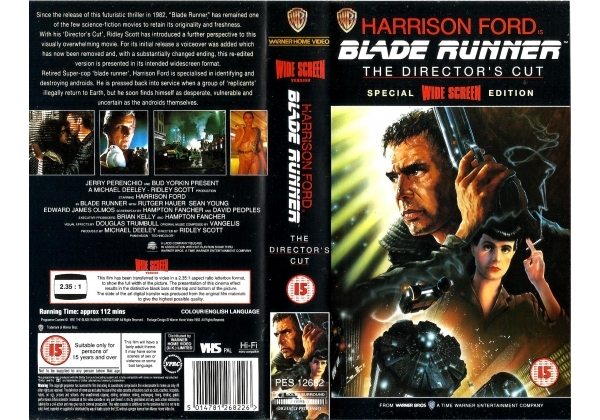 Or find "Blade Runner: The Director's Cut (widescreen)" on VHS and DVD / BluRay at Amazon.